First of all, imagine having a yummy brekky and a spiced chai concoction in a gluten-free friendly cafe on a lazy, sunny Saturday morning. Next, we meander along the city sidewalks, gazing at this and that in an assortment of interesting stop windows. Along the way, we discover it’s also an open art studio weekend. As a result of our visit, we have a renewed sense of creative energy and continue our journey to the museum. Almost to the Museum now, we see lots of people in motion, moving this way and that. Some are sitting, soaking up the sunshine. As we sit for a bit at the Museum front plaza, imagine looking down from the sky and seeing all the others arriving from different directions. Imagine now, entering the Museum and roaming lazily through the exhibits. Suddenly to my surprise and delight, I discover the famous ancient Fayum Mummy portraits on display on a wall across the room! I recognized them immediately but didn’t realize they were in the Museum. 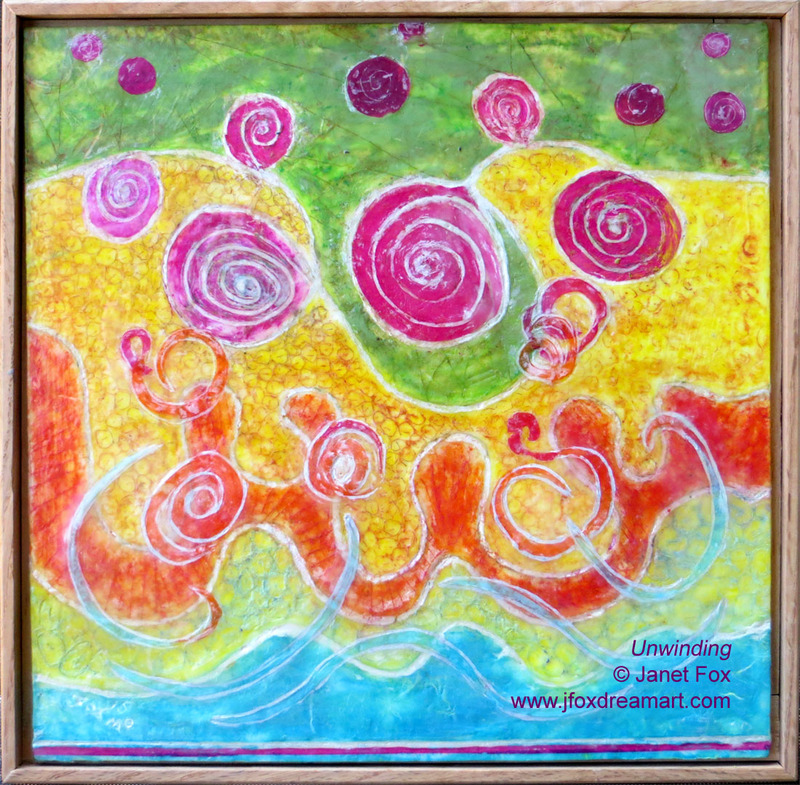 These paintings are some of the earliest known pieces using encaustic paint, which has become my favorite medium. As a result, photos of them are in many books about encaustic painting. My favorites include Noblewoman and Mummy Portrait of a Man. I stand mesmerized and study them for what felt like a very long time. So many questions swirl in my head. Who, specifically, painted them? What techniques did she or he use? Finally, did the painters back then have any inkling that many, many generations later, half-way around the world, people in Brooklyn would be viewing and appreciating their art with awe? I set out creating Cityscape by starting with one of my earlier paintings, Unwinding. 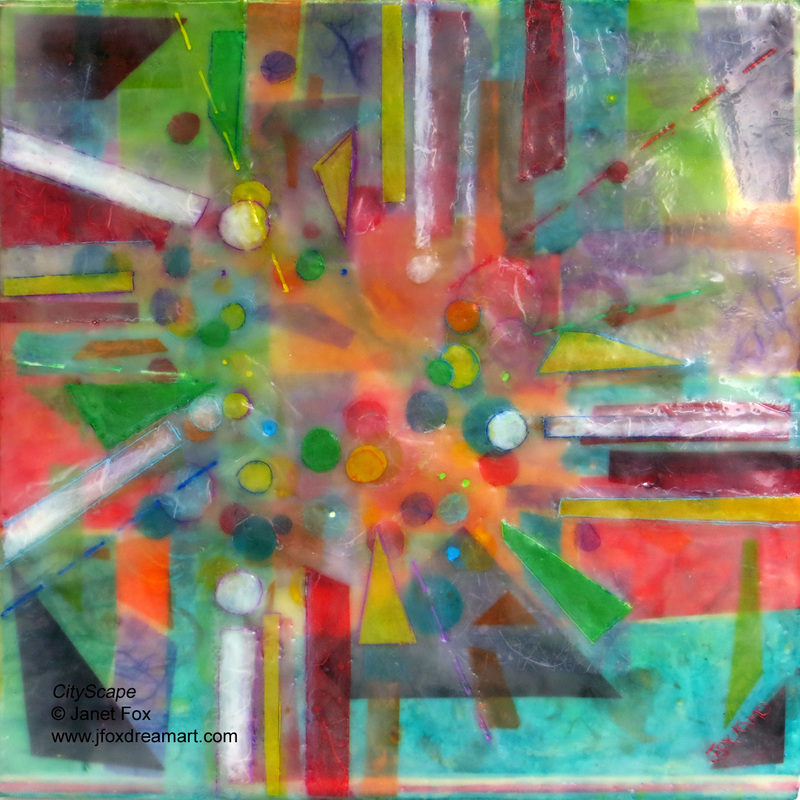 After heating and scraping away the paint, I added new layers of paper shapes and encaustic paint and medium. The rainbow of colors and shapes the diversity of people, structures, green spaces and energy. Going to the city to unwind and discover somethings old and new can be quite rejuvenating! How do you unwind in the city?